At Great Ciao, we’ve never been keen on the “cheese with stuff in it” genre. We’d prefer to source the tastiest cheeses, and pair them with delicious accompaniments. As luck would have it, we have some delicious new “stuff” to put on our favorite cheeses. Quince and Apple is a small husband and wife owned company dedicated to making small-batch preserves that capture the bounty of the Upper-Midwest. 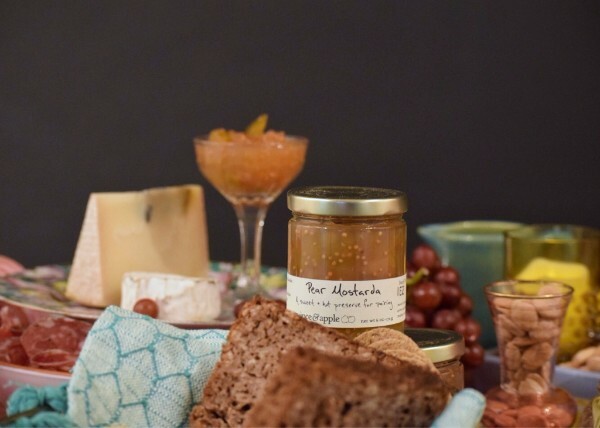 As Madisonites and natives of the Great Dairy State, each of their preserves are designed around pairing with cheeses, and are made when local fruits are at the height of their short Midwestern growing season. The newest addition to their lineup of preserves, is a sweet and spicy pear mostarda. We got a kick out of seeing Matt cook test-batches of mostarda wearing full hazmat regalia to protect himself from the potent mustard oil fumes, but after months of trial and error, he’s concocted a real humdinger. It has just enough well-balanced zing to brighten up your cheese plate, grilled cheese, or charcuterie board. “Inspired by a 15th century recipe, this mostarda is deeply rooted in tradition, while at the same time thoroughly modern, fresh and bright. Our mostarda combines sweet pears and apples with bright fresh lemons and the heat of mustard oil to create a subtle and well-balanced whole. Mostarda is an Italian condiment, hundreds of years old, that combines preserved fruit with the heat from mustard oil. It is traditionally served as an accompaniment for cheese, charcuterie and cured meats. We spent 18 months perfecting their ability to make an authentic mostarda that uses true mustard essential oil. Mustard oil is extremely difficult to work with, so most domestic mostardas use only mustard seeds, which lack the distinctive heat seen in Italian mostardas.